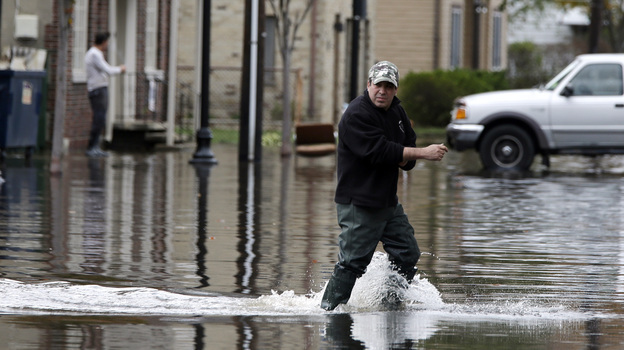 A man crosses a flooded street in the wake of Superstorm Sandy on Thursday in Little Ferry, N.J. Surprise coastal surge floods caused by the storm battered Little Ferry, Moonachie and some other towns along the Hackensack River in Bergen County, all areas unaccustomed to flooding. Every time a storm brings flooding to a large metropolitan area, there are calls to improve the levee systems that are designed to prevent flooding. But there's a major problem with doing that. "We don't know where all of our levees are," says Samantha Medlock with the Association of State Floodplain Managers. She says the U.S. Army Corps of Engineers knows about 14,000 miles of levees in this country, because the corps is supposed to be in charge of their upkeep. "Additionally, the Federal Emergency Management Agency, FEMA, has identified approximately 30 to 34,000 miles of levees," says Medlock. And there could be thousands of more miles. No one can say for sure. Why is maintaining an up-to-date levee inventory so difficult? Gerald Galloway, a professor in the department of civil and environmental engineering at the University of Maryland in College Park, says it's because of the way many levees come into being. "In many cases levees start from a farmer or a developer ... taking a grader or a bulldozer and pushing up a bunch of dirt to create a mound that keeps out frequent flooding from a particular area," Galloway says. Then people start building homes or businesses behind the levee, and it's in everyone's best interest to maintain it. But there are no mandatory national standards for what constitutes an adequate levee. There are voluntary standards set by FEMA and the Corps of Engineers, and the federal government provides an incentive for adhering to them. "In order to get the after-the-flood event support, you need to have met the standards of the Corps of Engineers in maintaining your levee and its overall structure," says Galloway. But keep in mind that money is only for after the levees fails. There's no federal money for routine maintenance. And from a flood manager's perspective, fixing a broken levee is not always the way to go. "Fixing a levee and solving a levee problem may not be the same thing," says Medlock. She says no levee will last forever, and a levee that might be adequate for conditions as they are today could be overwhelmed in the future because of climate change. "If we simply rebuild right back in place, we are setting the stage for the next major, costly, disruptive, tragic disaster," says Medlock. "Get appraisals for their homes, write them a check, knock the homes down, and just let it go back to its natural state," says Sweeney. "I think that's something we really need to take a look at. Because governments have allowed people to build right onto the water, and water has a tendency to move." "Ultimately this is about protecting people permanently. No levee provides permanent or complete protection. Buying out and relocating to higher, safer ground is permanent protection," she says.